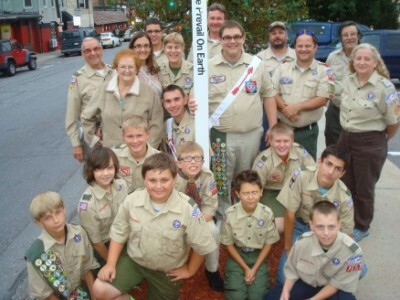 Troop 777 of Tamaqua- Boy Scouts of America- erected a Peace Pole at 24 N. Railroad St. Tamaqua, PA 18252 and dedicated it to the citizens of Tamaqua during a ceremony led by Bradley McAloose. On September 21, Bradley explained that the Peace Pole was written in four languages, English, German, Gaelic, and Italian. 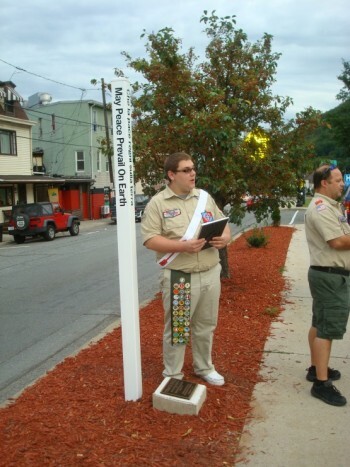 He mentioned that Peace Poles are located across the world, and that Tamaqua’s Peace Pole can be viewed on The World Peace Prayer Society’s website. He also observed a moment of silence for community and world peace and showed the certificate that 10 trees are being planted on the continent of Africa.